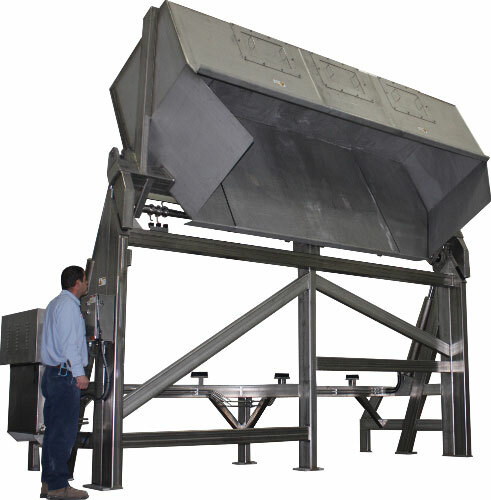 304 stainless steel loading skip is 172” wide x 44” deep. 96” discharge height, 9” projection. 60° discharge angle, 150° bucket rotation. 304 stainless steel frame with continuous TIG welds. Four (4) 3” nickel plated pivot bearings with a 3” diameter stainless steel pivot shaft. Welds on interior of loading skip are ground smooth, chute tapered to a 134” wide at discharge opening. Dual side mounted pivot cylinders for smooth bucket rotation. 10 HP/10 GPM hydraulic system with stainless steel wash-down duty TEFC motor housed in a stainless steel enclosure.